Sing with your hands! Free 'em up with wireless. Nady-the wireless pioneer that's been leading the way for 25 years-has made a giant leap ahead with the Nady Encore II LT Lavalier System. The receiver features dual retractable, front-panel antennas and DigiTRU Diversity digital processing circuitry to virtually eliminate dropouts and maximize operating range (250 ft. or 500+ line-of-sight). The rugged half-rack design has RF and AF 5-LED displays for monitoring incoming signal strength and audio level, balanced XLR and adjustable unbalanced 1/4" jack outputs, noise-free transmitter on/off operation, and unique snap-out side-panel locking tabs for convenient single receiver or dual receiver (side-by-side) optional rackmounting. The Nady transmitter works perfectly with the Lavalier mic supplied (omni or unidirectional) or a choice of Headmic headworn mics. 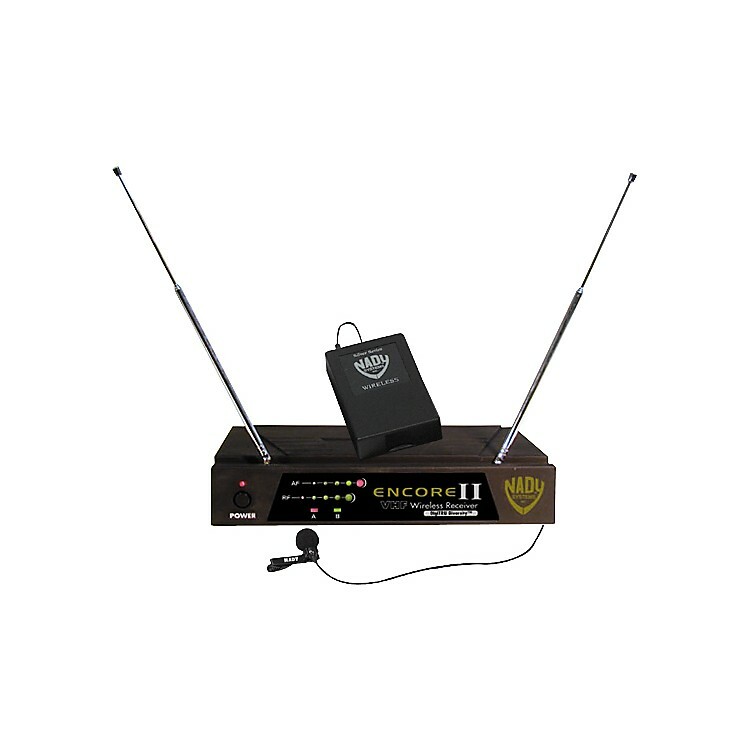 Encore II features top-panel input level adjust and locking mini-jack for secure mic attachment. Up to 15 hours operation time with one 9-volt battery.